Here’s a case of an author finding a reader. 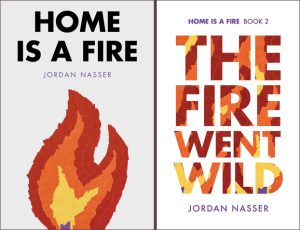 I was unfamiliar with Home is a Fire and The Fire Went Wild, which came out in May and November of last year. Author Jordan Nasser reached out to Will and I because he was interested in being a guest on Jeff & Will’s Big Gay Fiction Podcast. Since at least one of us wants to be familiar with, and like, the work of authors we interview, Nasser offered to hook us up with his books. I’m glad he did because I loved them. Home is a Fire is the story of Derek who is fed up with his life in NYC–including his boyfriend who he is about to marry. Derek flees the big city and returns home to Tennessee. He gets a job teaching at his old high school, reconnects with his friends who built lives for themselves there and enjoys being back home with family. His high school bully is still there too. Luke now coaches football at the high school and just seeing him raises Derek’s defenses. Luke has changed though. More than Derek ever thought possible. Lots of other stuff has changed in Derek’s hometown, too, and Nasser weaves all this together in a terrific lighthearted way. There’s not a lot of angst here, and it all works perfectly. It’s sort of like Steel Magnolias meets Tales of the City as Derek finds out secrets he never knew as a teenager–including that the football hero has a crush on him. The Fire Went Wild picks up with Derek and Luke as a more public couple. They quickly discover being out and proud is very much against the southern code of discretion. The dynamics that form between Derek and Luke are surprising and adorable as they deal with family and career ramifications of their relationship. Nasser paints what I believe, based on my own experiences in the South, to be a pretty accurate representation of what it would be like in their shoes. This second book has a great split focus as you get to see both Derek and Luke’s relationship grow, but also many aspects of their families, friends and townspeople. It’s interesting to see who comes out on their side and who the troublemakers are. Nasser handles all the characters very well and creates a very modern look at how a small conservative town handles a very public coming out. So much of these books speak to me–from the Southern roots since I spent fifteen years in that environment, to the character of Derek who flees NYC because he’s had enough of that face paced city. I’m so glad I’ve met Nasser and been introduced to his books. I look forward to the next in this series, which should be along sometime this year. He talks about that and a lot more when he’s on the Big Gay Fiction Podcast‘s episode 16, which comes out January 25. Thank you so much, Jeff and Will. I’m so thrilled that you enjoyed the books! I’m looking forward to our podcast!